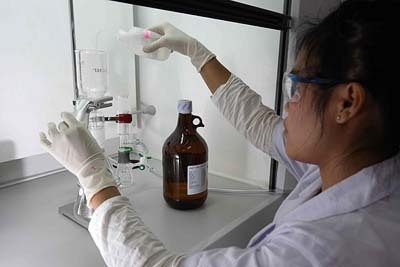 The Environmental Unit's water quality and quantity monitoring team regularly checks water samples from 83 stations around the plant area, analysing them in THPC's purpose-built laboratory at Kheunkham. 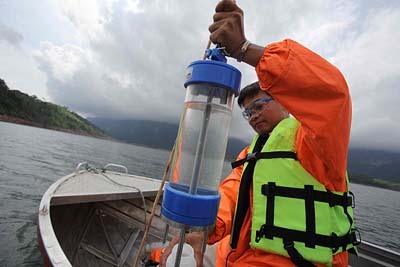 Samples come from rivers upstream and downstream of the project, and from the Nam Gnouang Reservoir. This work enables the company to keep abreast of trends in water quality and to gain early knowledge of any critical conditions or threats to environmental standards. The team checks a variety of parameters and indicators including levels of dissolved oxygen in the reservoir and in water released downstream, the evolution of water quality at pertinent points throughout the watershed, changes in water temperature, and downstream riverbed erosion and sediment transport. Water Quality Monitoring for the Expansion Project began in 2009 and THPC is compiling a reliable database of hydrologic data for the full project area. The program's 30 gauging stations for stream flow, rainfall, groundwater levels and river water levels provide a body of information that allows THPC engineers to optimize operation of the reservoir and power stations. Hydrological data from the Nam Hai and Nam Hinboun is used to estimate flood levels, determine river morphology effects and to assist in planning for relocation areas. 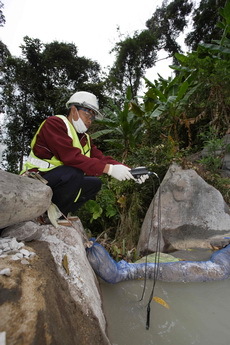 Throughout the construction period the Environmental Unit monitored discharge from building sites and worker camps to ensure proper use and disposal of hazardous chemicals, adherence to high standards of wastewater and sewage treatment, and control of sediment loads during construction activities. THPC teams also regularly check water supply in resettlement and relocation villages to ensure that water consumed by villagers of good quality.